This is the Zette System, handcrafted from wood by Swedish artist Love Hultén. In its resting state it resembles a stylized wooden boombox, but it’s actually a retro gaming machine with a pair of wireless gamepads and a built-in projector. Only 25 of them are being made, and they are not cheap. 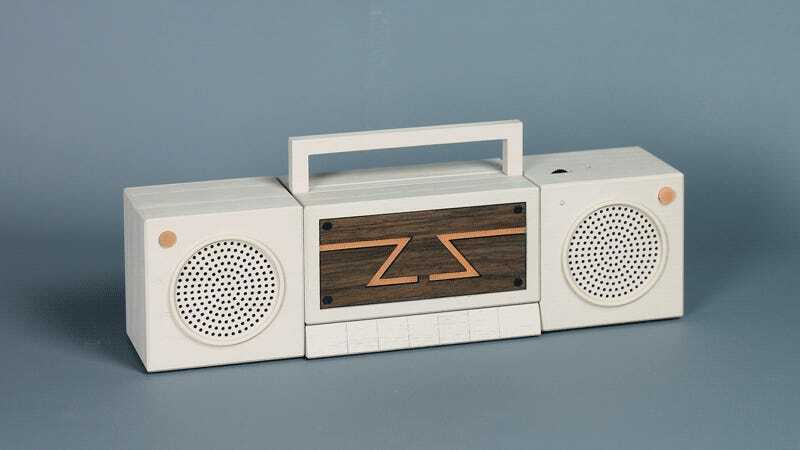 From boombox mode, the Zette System breaks down into four separate components. One speaker unit houses a computer designed to emulate classic consoles, from the Atari 2600 to the Super Nintendo, as well as a 640 x 480 DLP projector, low resolution but perfect for these purposes. A 2600mAh battery powers the system for up to two hours, though it can be plugged in as well. The center of the boombox houses a pair of wireless game pads. Wooden with smoky amber directional pad and buttons, they look more functional than comfortable. Then again, wood always feels softer than it looks. It’s part of its charm. The second speaker is a speaker, providing additional sound. It also provides storage for the cables and USB dongles needed to connect everything together. The parts are connected with neodymium magnets, which explains the lack of external screws. For those who prefer joysticks, there’s the larger Zette System arcade edition. Instead of wireless gamepads, it boasts a pair of small, six-button arcade joysticks. Here’s a look at the Zette System in action. Limited to only 25 units and priced at €1899.00 ($2,255) for the standard version and €2399.00 ($2,849) for the arcade edition, perhaps it’s better to think of the Zette System as art than a retro gaming console. It’s both, but only one descriptor is going to justify the investment. Love Hultén has been combining old materials with new technology for years now, creating one work of gorgeous functional art after another. His Zette System is now available for preorder. If you get one, send me pictures.